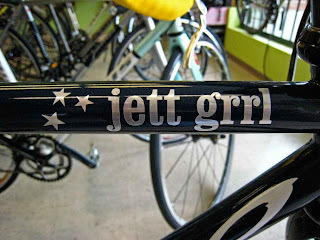 Cycling Caps at Jett Grrl! 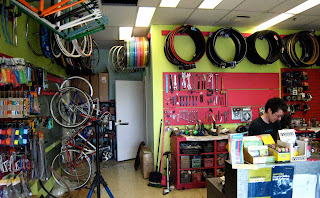 There's an excellent bike store on the edge of Chinatown/Strathcona, Vancouver. 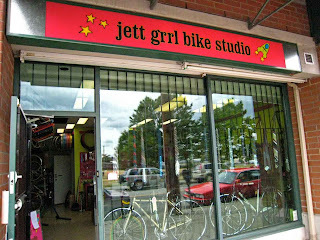 Situated at 247 Union Street, we discovered, "Jett grrl bike studio." And, what is refreshing is the attentive and friendly service by owner, Tracy Myerson. She's incredibly busy building wheels and always has a nice steel bike on the stand to repair. The shop is humming along as Tracy took time to look at Galstudio's fashionable cycling caps and now they're on for sale. Jet grrl has the reputation of providing honest, fair, quality workmanship unmatched anywhere. 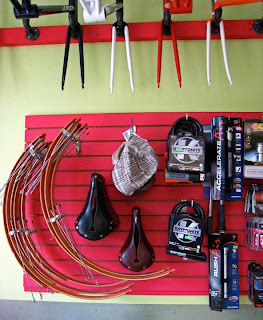 And, Tracy is a certified bike mechanic offering repair workshops all in a relaxed & friendly environment. 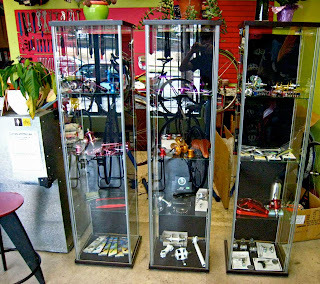 Jet grrl offers the steel bike aficionado a fine selection including: Traitor, Soma, Pake, IRO & more. And, Italian steel is offer too. 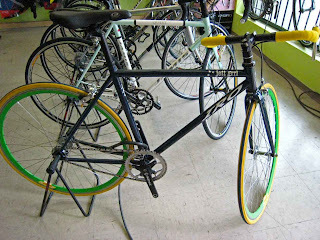 I saw a Marinoni, Coppi and Gucerotti for sale... a collector would drool over. There is also a fine stock of parts & accessories. I bought myself an early birthday present. A very nice twin 6 cycling jersey! All I can say is get yourself down there, have a look at what's on sale & be prepared to enjoy Tracy's knowledgeable & friendly service. That's Tracy working behind the counter! wooden fenders & cool seats!